World Sailing and the IOC have finally concluded the Tokyo 2020 qualification system, including continental qualification. The 49er has 19 spots at the games, 20 for the Nacra 17, and 21 for the 49erFX. The previous baseline of 20 was slightly adjusted to account for a 50-50 male-female ratio at the games, while managing to have 4.5 events for women and 5.5 events for men. The basic qualification system is 1 spot in each event for the host nation, then 40% of the spots at the Aarhus 2018 Worlds, then the next group qualify at the 2019 Worlds in Auckland, with the final opportunity being the continental qualifiers which are six spots, one each for Europe, Africa, Asia, Oceania, North America, and South America. So, here is the table of total spots available, with the green ones as already completed. 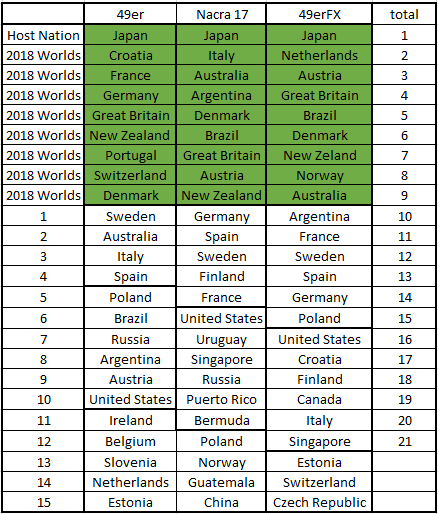 With almost half of the spots assigned, here is who has qualified (green) and then next 15 countries in each class from the last Worlds. The cut off line at 4, 5, and 6 (left) shows who would hypothetically qualify via the 2019 Worlds in Auckland, and then the cut offs at 19, 20, and 21 (right) represent the Olympic fleet size. The final stage of qualifying is continental qualifying, which has one spot per continent. Here’s where things get a bit tricky. With only 18 months until Tokyo, we basically know who’s trying to get there and how things have already worked through qualifying. In Africa, we do expect teams to try and qualifying in 49er and Nacra 17, but not in 49erFX. Each of these African nations will get a spot to Tokyo 2020, but their National Olympic Committees may opt not to send them, which cannot be accounted for at this point. So the 49erFX will likely get one additional quota place up for grabs in Auckland. In Oceania, both New Zealand and Australia qualified in both 49erFX and Nacra 17, and we won’t expect other nations to try and qualify. In 49er, Australia is assured of winning the Oceania CQ, since no other teams will be trying, and it would seem likely their NOC will send them since they have won medals at each of the last two Olympics. So both 49erFX and Nacra 17 will get one additional quota spot up for grabs in Auckland, and in 49er, we an assume that the Australians will get the Oceania spot, and therefore there might be one additional quota spot if they are in the top 4 not yet qualified in Auckland. In all of the other continents, there will be multiple teams competing for the Continental Spots, so they seem likely to be taken. The above outlines what’s at stake for the 2019 Worlds, and highlights why the 2018 Worlds were so important. The continental qualifiers have recently been announced, and they play the next crucial role. Most of the continental regattas are pretty straight forward, but each has a few wrinkles. The Genoa World Cup entry system will be modified so all teams needing to qualify will get entry to the regatta. This could be especially crucial in the 49er with so many European teams on the outside right now. Africa will also use this regatta as it continues to be a greater challenge to assemble a fleet of shipped boats in Africa than in Europe, where boat availability and transport are much easier. The Pan Am Games is also allowing every nation to enter, which helps more nations get to the Pan Am Games. However, it is strictly one entry per nation, so MNA’s that have many teams, like the USA for example, are at a bit of a comparative disadvantage than had another regatta been selected. However, having national teams able to combine their efforts toward both the Pan Am Games and Olympics was seen as such a large factor in the Americas that the trade off was deemed worth it. This regatta is also out of sequence with the timing continental qualifying is designed for, but the terms of Olympic qualifying dictate that the Pan Am results will be utilised as if the regatta occurred after the 2019 Worlds in Auckland. The out of sequence Continental Qualifiers makes for odd incentives at the 2019 Worlds. Because the Pan Am Games occur before the 2019 Worlds, the attributed order is important. For a nation in either North or South America that comes 2nd at the Pan Ams, they will still have two routes into the Olympics. They can either finish in the 2019 Qualifying Nations outright, or if the nation that beat them at the Pan Ams can finish as a 2019 Worlds Qualifying Nation, they will inherit the continental spot. So in either case, they will gain an Olympic berth. The Oceania Qualifier is straight forward enough. The 2020 Worlds occur two months after the 2019 Worlds, and most teams will be doing a down under circuit to compete in both events. The Asian qualfiers are the only ones separated out from each other. The primary driver for hosting three events is that 49er and Nacra 17 growth in Asia is so strong that the class wanted to reward three key builders of the classes with these events of consequence. 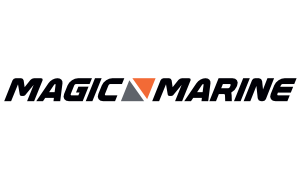 In the past five years, Asia has accounted for 25% of all sales, with that rate reaching 33% in 2018. The 49er, which leads the growth, may have 10 or more nations competing in the continental qualifier, which would make Asia the second largest continent for high performance sailing. Each of Shanghai, Abu Dhabi, and Hainan have invested in these classes, and therefore have the ability to supply charter boats for teams unable to ship a boat to the CQ, which is of huge importance. “We are very proud of the recent growth rates in Asia of high-performance sailing. Both the 49er Class and Nacra 17 Class have been working hard to facilitate new countries joining our classes, and it seems that the tipping point has been reached as growth and participation builds,” said the president of both Classes, Marcus Spillane. Qualifying in general remains a huge challenge for teams in all three classes and a major milestone to achieve. Each of these classes is approaching participation numbers near 40 nations, so roughly half of the countries trying to get to the games will not be able to. However, the journey of Olympic qualifying is an incredibly rewarding one, and both the teams who qualify and those who don’t will take satisfaction from knowing they did all they could to reach for their dreams. Ensure you catch all the 49er and nacra 17 news by subscribing to our newsletter. Here are the overall document and continental document links.